We have complained before about ad creep, how the public realm is being taken over by private marketers. 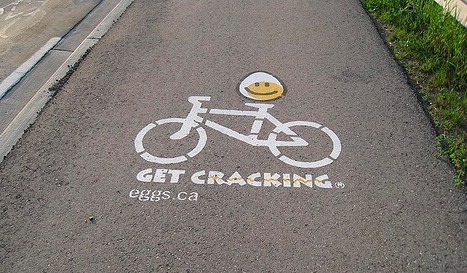 I don’t know if I should be happy or sad that the Egg Farmers of Canada have determined that there are enough cyclists in London, Ontario that they want to pay to advertise to them by painting ads onto bike lanes. This entry was posted in News and tagged ad creep, london, outdoor, public space, the law. Bookmark the permalink. Post a comment or leave a trackback: Trackback URL. Someone here in London, Ontario has counter-attacked. Those photos were taken in the same location by the way. I bike down that path, and I happened to see the changes not long after they were made. I suppose the spraypainting and the scrubbing may have been done by different people. I’ve just assumed otherwise.